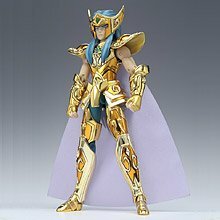 From anime and manga Saint Seiya (Caballeros del Zodiaco), this is Saint Seiya : Gold Cloth Aquarius Camus Action Figure . A PVC figure of Camus, and a set of die-cast Aquarius Cloth. The spiffy ‘book-box’ opens to reveal that it consists of two window boxes; in one window box is a really well-articulated figure of Camus, along with some of his Cloth parts, diadem, gauntlets, etc. In the other half is the rest of his Aquarius Cloth, base, and Hyouga’s head. 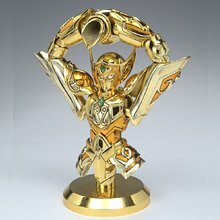 Deck Camus out in his armor, or build the ‘Aquarius Obje’ and pose it with him. Aquarius Camus (水瓶座のカミュ, Akueriasu no Kamyu) is a Gold Saint, guardian of the temple of Aquarius, and also Cygnus Hyoga and Kraken Isaac’s master in manga. In the anime, he was the master of the Crystal Saint, who was Hyoga and Isaac’s master. Camus is a cold looking Saint, since he believes the Gold Saint, as the strongest among Athena’s guards, should never show exasperation or it would draw the people into despair. In the manga, he reveals that he actually knew that the Pope wasn’t working under Athena’s will, but he still kept working under his orders to fulfill his role as the Aquarius Gold Saint. Even so, he was glad to see his pupil Hyoga fighting for the real Athena. Since Milo fought Hyoga, he mentioned Camus in a way that led the fans to believe they were close friends. Apparently, this was made official since the animation of the Hades saga included more personal interaction between them than the manga, and they are depicted as friends in Saint Seiya Episode G.
Diamond Dust (ダイヤモンドダスト, daiyamondo dasuto): A basic technique using the freezing Cosmo energy to shot a blast of freezing energy. Kol’tso (Russian for ring) (カリツォー, karitsō? ): Although Hyoga used this attack sometimes in the original series, it was never said Camus also possessed it until he used in Saint Seiya Episode.G. It creates rings of icy wind that encycles the body of the target stopping its movements. Freezing Coffin (フリージングコフィン, furījingu kofin): This is a technique used to lock a body inside a block of ice, but since it has a slow realization it probably is not effective against moving targets. 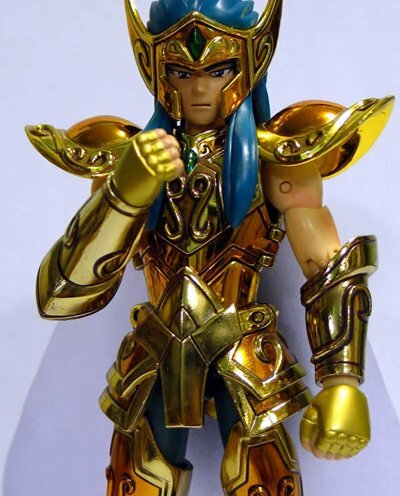 Although he commented not even the combined strength of all 12 Gold Saints could break this, Griffin Minos destroyed it with a punch when used as a wall by Cygnus Hyoga. Even so, when someone is locked inside it, the only way to get out is creating a temperature lower than that of the coffin.